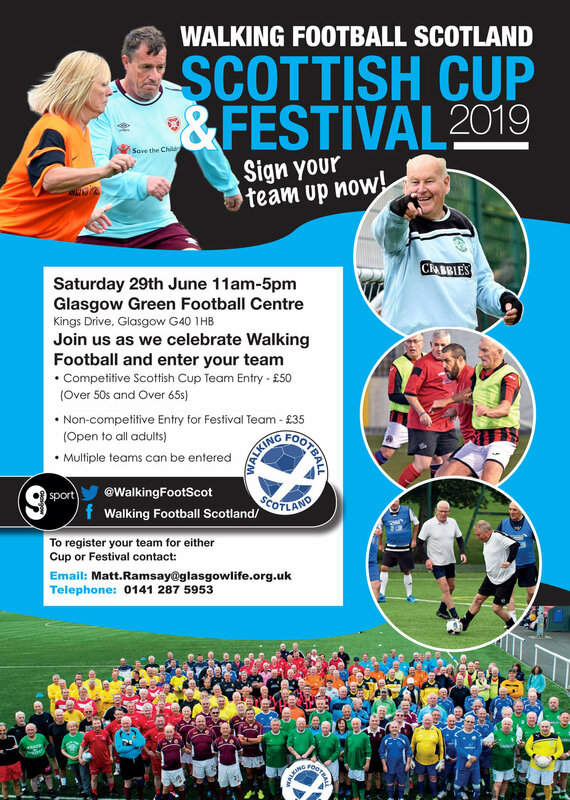 Working in partnership with Glasgow Sport, The Scottish Football Partnership Trust and the Scottish FA we are delighted to invite you to sign up for this year’s walking football Scottish Cup and Festival, returning once again to Glasgow Green Football Centre on Saturday June 29th. We are delighted this year to announce there will be two different age groups, competing for two Scottish Walking Football Cups, an Over 65’s Scottish Cup alongside the established Over 50’s Scottish Cup. On the same day as the competitive competitions, we are excited to offer a non-competitive element where teams can sign up and participate in either the Scottish Cup or take part in the friendly Festival. So come along and be crowned Scottish walking football Champions or enter and be part of a wonderful friendly Festival and showcase walking football being played at its best. Festival will be non-competitive and friendly in nature and is priced at £35 per team. Maximum of 64 teams can take part. Come and try walking football. (Clubs can enter more than 1 team) and adults 18 years+ who play with the true ethos of walking football and play fair and safe are more than welcome to take part. No medals, No trophies. Come enjoy the camaraderie and fun. We hope that with over 80 affiliated Walking Football Scotland clubs, you will sign up to take part in this festival of walking football. Please sign up at your earliest and not be disappointed.